Blogger Warning: HERE BE SPOILERS! Ahhh… absurdism. It’s so damn European! Think Albert Camus, Samuel Beckett (o.k., so he was Irish), Franz Kafka, Eugène Ionesco, Jean-Paul Sartre. It’s a genre that includes classic books like The Myth of Sisyphus, The Stranger, Waiting for Godot, No Exit, Rhinoceros and now, The Investigation. The Absurdist genre – in all its forms – is a commentary on the ridiculousness of the human condition. It also, interestingly, involves an unexpected amount of physical comedy. (The French fascination with slapstick and Woody Allen baffles me, by the way). The Investigation is pretty much a textbook example. Whether this is a strength or weakness is really a matter of personal taste. The plot can be quickly summarized. The Investigator has been sent to investigate the Enterprise. Multiple impediments are put in the way of his investigation, placing him in one preposterous situation after another. This continues until the end of the novel, at which point the Investigator (and the readers) question the protagonist’s sanity. Suddenly, he is transported into a surreal landscape where he speaks to a God-Surrogate, who in turn reinforces the characterization of an un-caring (at best) or impotent (at worst) higher being. All fairly standard in the Absurdist’s ouevre. Claudel delves deeper into the genre/philosophy – not just speaking about the absurdity of life in general, but like Camus exploring the subject of suicide. The Investigator has been sent to the Enterprise to investigate an unusual high incidence of suicides among the workers. As the Investigator’s mission is thwarted at every juncture we begin to see why death might seem like a viable option. 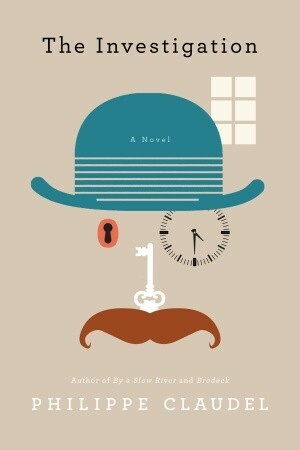 (And if you find my constant use of “the Investigator” annoying, this it nothing compared to the book). Meanwhile, as the philosophy and plot thickens, Claudel introduces us to a cast of eccentric and memorable characters. The Giantess, the Policeman, the Watchman, the Founder… to name just a few. My personal favorite is the Manager. The Investigator, not daring to disappoint the Manager, nodded his head. The Investigator was getting weaker. His armchair had turned into a great mouth that was gradually swallowing him, and he found the man before him, who was jumping around like an athlete warming up, even more disturbing than the Policeman in the Hotel. The Manager began to do entrechats, up-and-down bounces, long leaps. He piroetted and ran to the back of the room, where he made the sign of the cross, took a run-up, and charged at his desk, over which he attempted to jump and which he nearly managed to clear, except that at the last moment, when he was suspended in the air, his left foot struck the massive black marble inkwell and he crashed heavily against the glass wall. While no expert, I’ve read a fair amount of Kafka, Sartre and Camus. Maybe that’s why I felt a sense of déjà vu as I read The Investigation. The Chaplin-esque situations the Investigator finds himself in aren’t cliché. Some are even very funny. Unfortunately the ideas and themes that Claudel is working with… I feel like I’ve heard/seen them all before. It reminded me of a production of Thorton Wilder’s The Skin of Our Teeth, starring John Goodman, which I saw years ago at the Delacorte Theater. The play is Wilder at his wackiest. Goodman was brilliant and loud. All through my reading of The Investigation I kept remembering that play, its overblown comedy and heavy-handed (yet still incomprehensible) biblical references that in many ways overshadowed the plot. Like Wilder’s play, this novel is saved by incredible writing. Claudel’s style and Cullen’s translation are lovely, truly lovely. The fact that I continued reading long after I knew I’d heard this story before is testament to that. Philippe Claudel is a gifted author. His prose is light, entertaining and fresh. His imagery is vibrant and cinematic. The situational comedy is good. Which makes what I’m about to write so puzzling. Things became interesting – at least for me – when the character of the Psychiatrist was introduced. I believed that we would be forced to take a hard look not just at the society through which the Investigator was moving, but also at the kind of man that society inevitably creates. And then, suddenly, Claudel veers off. Chucks the whole thing out the window and… well… remember how LOST ended? Yeah. Something like that. So, despite the novel’s originality and Claudel’s obvious talent, when the ending of The Investigation arrives it does so with a resounding (and uninspiring) “Click”. From Away is a different kind of mystery novel. It opens with Denny Braintree on his way back from assignment for the Fearless Modeler, the model train magazine he writes for. He crashes his rental car into a highway median and ends up stranded overnight in Montpelier, Vermont. Locals mistake him for Homer Dumpling – the hometown favorite who’d abruptly left without a word 3 years earlier. Denny, being Denny, immediately decides he likes being Homer. Mostly because everyone likes Homer (a new experience for Denny, who nobody seems to like). Partly because the next morning Denny Braintree becomes the chief suspect in a murder investigation. From Away contains multiple mysteries – there’s the murder, discovering what happened to the real Homer and the biggest mystery of all… what is the deal with Denny? David Carkeet has created a 330-pound hero who isn’t even trying to be sympathetic. Within the first chapter it’s apparent that not only is Denny obnoxious, he knows it. He’s obnoxious by choice – to get a reaction and to make life more interesting. This self-awareness disarms you and redeems him. It also adds a certain amount of comedic value to the situations Denny finds himself in. Denny had to hand it to him. The pause had been good, of professional caliber, really. He looked from the trooper to the men in the front seat. Without moving or making a sound, they were chuckling. The amusement was contained, effectively sealed from view, but there could be no mistake. The Yankees were laughing at him. This isn’t a book about character evolution. The Denny you encounter in the beginning isn’t all that different from the one you’ll leave at the end. He doesn’t get any nicer – as he says himself: he likes the way he is and doesn’t get why other people don’t. What changes is the readers’ perceptions. As the story gains momentum you’ll start to understand Denny and come to see who he is reflected in the people around him. You’ll want him to succeed – to get out of the mess he’s put himself in, to make friends, to keep up the facade of being Homer. There’s a stark honesty in how Carkeet has written his hero. Like Ignatius J. Reilley (A Confederacy of Dunces) or the Binewski children (Geek Love) or Tom Robbins entire bibliography of characters, Denny is an odd egg not without certain charms. He may be a bit weird, but he’s no hypocrite. He just sees the world from the outside looking in, which is the same way he explores his model train layouts. The more we learn about Denny and Homer and the people of Montpelier, the easier it is to appreciate Denny’s unique perspective. From Away contains quite a bit of physical comedy. The kind more common in films than books. Carkeet manages to translate it nicely into print, resulting in some hilarious scenes. He’s created a large supporting cast of characters as goofy as Denny and a plot that is rock solid. He’s got great comedic timing. What’s best, though, is how much of From Away is unexpected. It you read a lot of mysteries, you already understand what a rare thing that is. 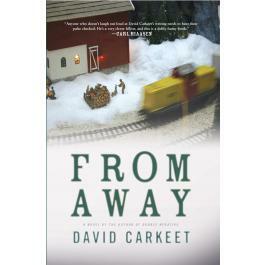 David Carkeet is an author with a big, bold voice telling a story with surprising subtlety. His clues are to be found in the small details – not in conspicuously placed plot points. From Away is a mystery that stands out from the crowd, that will make you laugh and repeatedly catch you by surprise. It may take a little while to warm up to Denny, but once you do there’s no going back.